Shop for groceries and help save the environment at the same time with your own customized reusable grocery bags. Choose your own style and layout and add photos and custom text to design your bag. 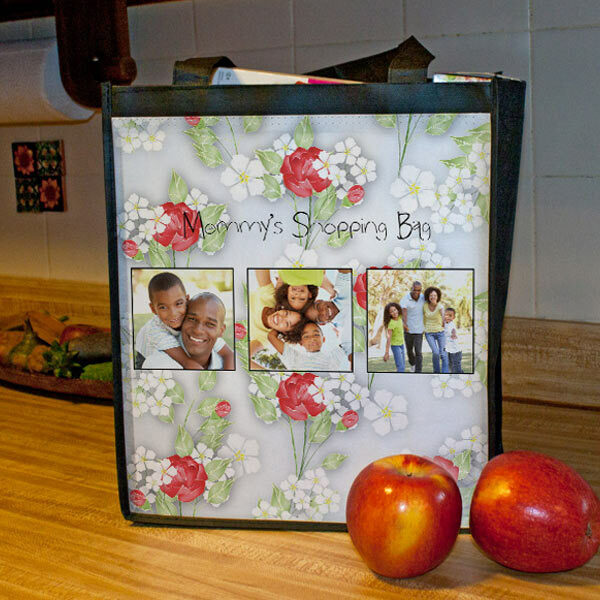 Our custom grocery bags are made from recyclable materials and can be personalized with photos, text and a wide range of colorful templates. 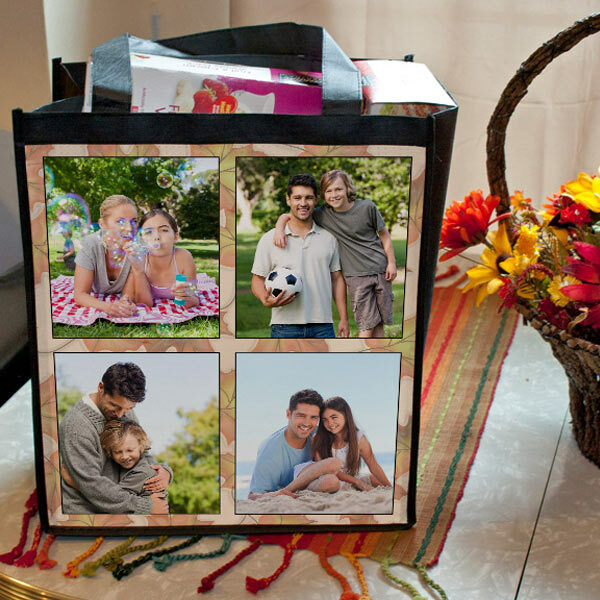 Have your designs on both sides so you can show off your photos wherever you go! MailPix also offers canvas tote bags with matching or complimentary designs. Awesome product and service. Didn’t expect to get it before Christmas but I did. I’ll definitely be ordering from MailPix again! Fantastic, I bought nine bags for my kids and grown grandkids. They love them. 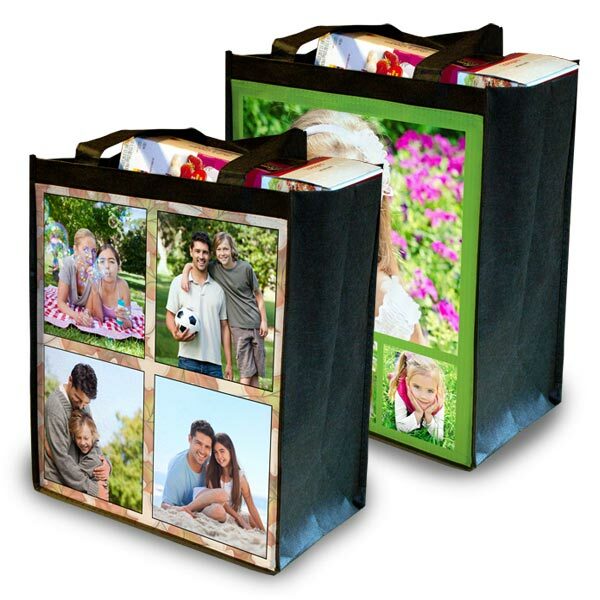 Pictures look great and they were printed on both sides so can be shown off no matter which way you carry the bag. I did have a slight glitch in my order, but with the wonderful Customer Service this got taken care of with a minimal effort on my part and it was all taken care of through email. I will definitely order more from MailPix again. I received all 3 orders and I absolutely LOVE my reusable bags. I am going to shop on your website a lot from now on. I appreciate the prompt printing, quick shipping and awesome customer service. I can’t wait to see what i’ll create next. I’m soooo happy i found you. ? I ordered these grocery bags in 2013 so my husband could show off pics of the kids when he was bringing treats to his clients. The bags turned out wonderfully and are very durable. I am still using them and getting compliments. I just ordered a new set of bags to give to my daughter’s teachers as thank you gifts for the end of school. I placed the order and the next day, I realized that I had messed up the photo I sent to be put on the bag. The customer service was awesome and they replaced my bags to use the correct photo free of charge. Mailpix saved the day! Thanks so much! Really great products and wonderful customer services. Awesome! I just love how great my bags turned out! I would definitely recommend these to everyone!